Where Roots And Wings Entwine: Fireman Sam Jupiter Drive and Steer review. Fireman Sam Jupiter Drive and Steer review. Bug loves all things to do with firemen and fire engines. He was overjoyed when he got to sit in a fire engine when on one of our trips to Folly Farm there happened to be a fire engine there for children to learn all about fires and the fire brigade. 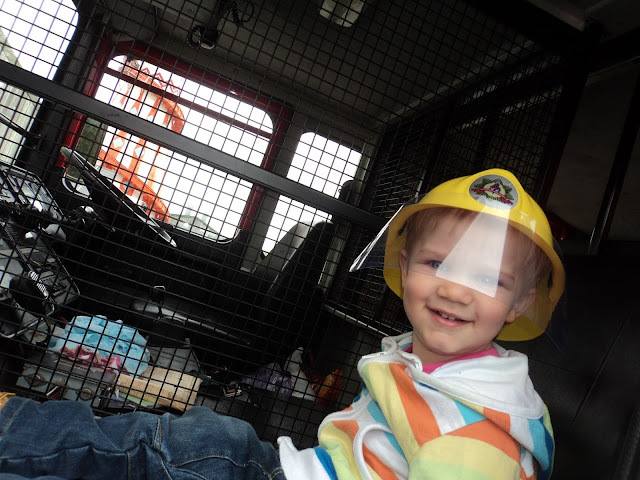 Being a tad obsessed with all things fireman related he insisted on being bought a bright yellow fireman hat which he keeps in pride of place in his fire engine tent at home where he loves to sit inside and read books, draw and play with his Lego Duplo before tackling imaginary fires. When we recently had the drama of a large fire on the farm we live on, Bug who was unperturbed by the chaos all around him as the fire blazed mightily loved seeing all the firemen and the 4 fire engines come to his home. As Bug loves all things fire engines when we were offered the opportunity to review a new toy from one of his favourite TV shows, Fireman Sam I jumped at the chance. 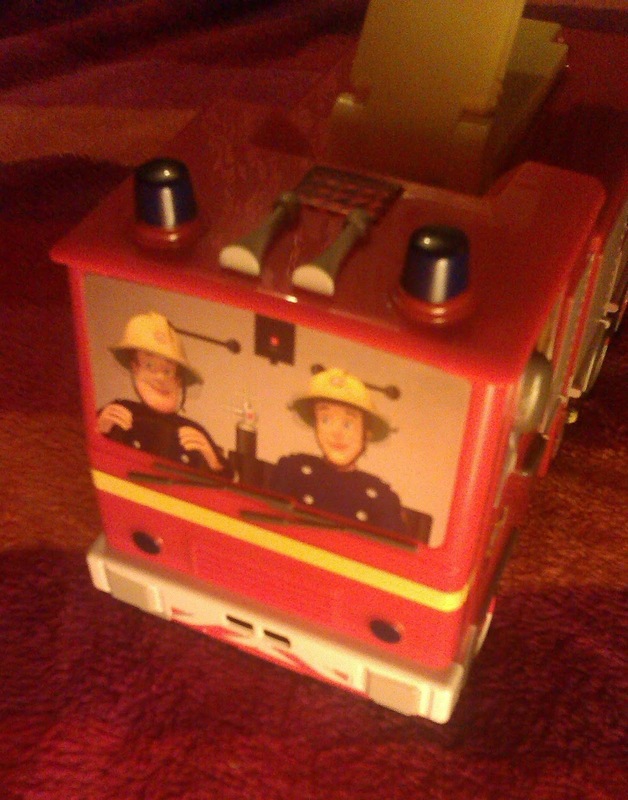 The Fireman Sam Jupiter Drive and Steer is a remote controlled fire engine. The drive and steer Jupiter consists of the Jupiter fire engine and a remote control steering wheel. The Jupiter fire engine is approximately 23cms long and has decals stuck on the windows showing the firemen who are racing off to save the day and put out the fire. On the back of the fire engine is a moveable ladder (the ladder can only be moved manually, and is not remote controlled). 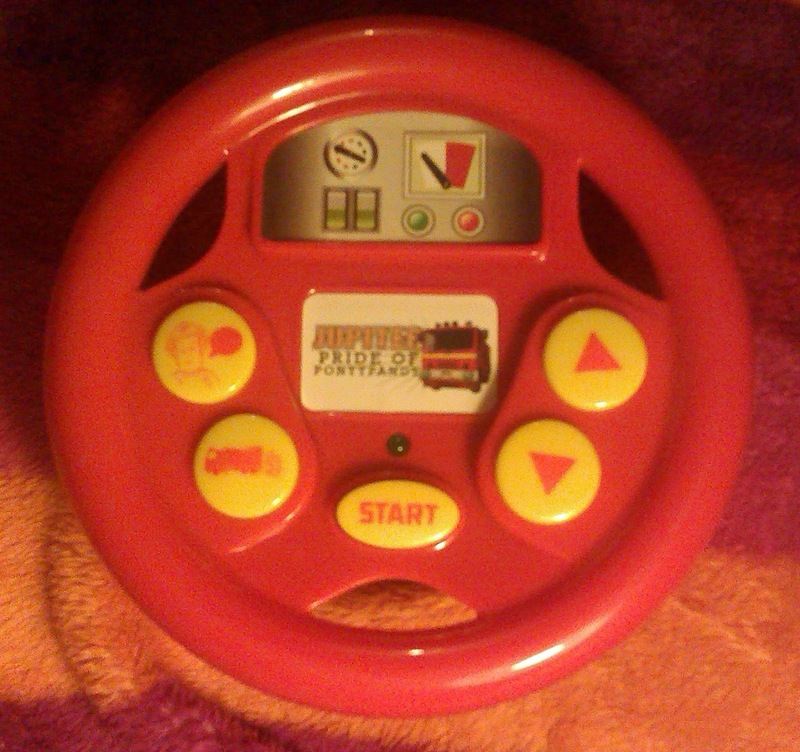 The fire engine has 3 sets of wheels which can be controlled using the remote control steering wheel, by moving the steering wheel left or right you control the front wheels and move the fire engine in different directions and the middle set of wheels are controlled by the forward and reverse buttons on the steering wheel. 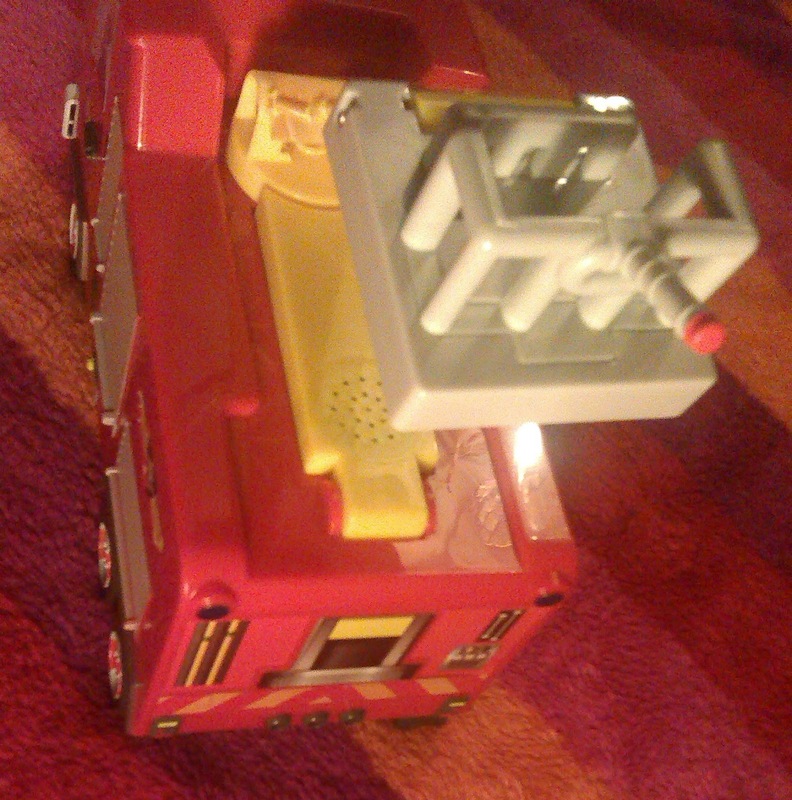 The Jupiter fire engine also makes sounds, the Fireman Sam theme song and a fire engine siren. The sounds from the fire engine can be muted for quiet play by selecting the mute option on the on/off switch at the base of the fire engine. 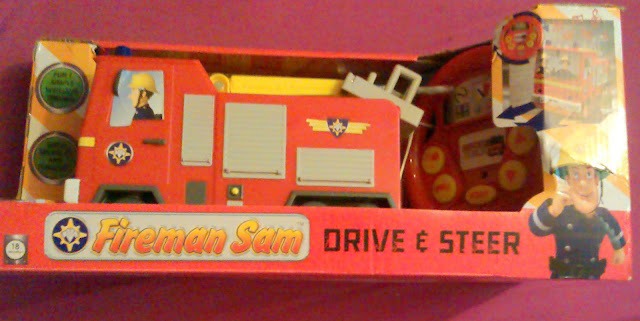 The Fireman Sam Jupiter Drive and Steer requires 8 AA batteries in total to power the fire engine and the remote control, 4 for the fire engine and 4 for the remote control steering wheel. Bug was delighted when he first saw the Fireman Sam Jupiter and quickly started zooming it around the room manually. When he was shown that the steering wheel could move the fire engine he was over the moon and quickly mastered driving Jupiter…….driving Jupiter a lot better than I can! Bug loves driving and steering his shiny new fire engine to go and fight fires, making lots of use of the turbo button on the steering wheel to make Jupiter go faster s that he can get there quicker to save the day. He has quickly learnt what the different buttons do and loves pressing the sound button to hear Fireman Sam speak. 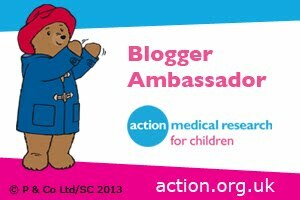 He also loves hearing Jupiter play the Fireman Sam theme song, dancing along to the song. Even though the sounds of the fire engine do not bother me I do think it is great that Jupiter has been designed to have a mute button for quiet play for parents to have some quite time without noisy toys blasting. 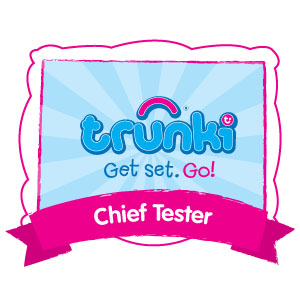 However I do think it is a tad disappointing that the steering wheel cannot be muted to make quiet play more achievable as little ones are quick to find and repeatedly press noisy buttons on toys, as they can still press the sound button on the steering wheel quiet time will not be so quiet with Fireman Sam’s voice emanating from the steering wheel. A small problem we have found with Jupiter is that it does not always drive well on our thick carpets, often getting stuck and will only move when placed somewhere else. Even though it can be a little frustrating for Bug that the fire engine to not always drive smoothly and quickly across the floor he has so much fun playing with his shiny new red fire engine he is not fazed and quickly get Jupiter racing to the fire once again. 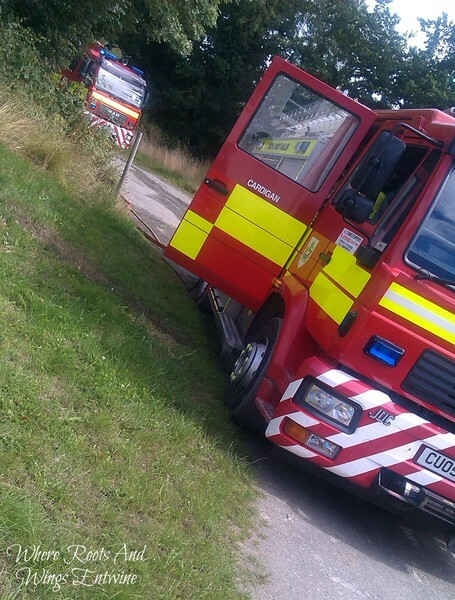 As it only seems to be every now and again that the fire engine struggles on the carpet I would say that it would have no issues on carpets that are not as thick or on laminate/wood floors. It is a shame that the Jupiter does not come with a small fireman figure to use when playing with the ladder which I think would make the fire engine set ever more enjoyable and interactive for little ones. Bug has loved playing with it and uses his little Lego Duplo figures to stand on the platform as he pretends he is just like Fireman Sam, fighting fires and rescuing cats stuck up trees. As much as Bug loves controlling the fire engine with the remote control he has also enjoyed simply playing with the fire engine, moving it manually and playing with the steering wheel by itself too, imagining he is driving a car. As well as being lots of fun to play with I think the Fireman Sam Jupiter Drive and Steer remote controlled toys is also great for developing hand-eye co-ordination and teaching children about cause and effect. I think the Fireman Sam Jupiter Drive and Steer is a high quality remote control vehicle that little ones will love playing with and the perfect gift for Fireman Sam fans. The Fireman Sam Jupiter Drive and Steer which is available to buy on the Character Online website has an RRP of £29.99 and is suitable for children aged 18 months+.